June 2013: Selected as the best photo by Amogh Desai, Founder and Director of the National Institute of Photography (India), “London Bridge from Top of Shard” by Raquel Santiago has won the TimeWave photo contest. Please see further details of the contest on award.io’s TimeWave page. Given the competition’s theme “Photo memories of your life,” Santiago’s photo captured a startlingly beautiful aerial view of London Bridge. The TimeWave team is thrilled to see this entry and announce Santiago’s photo as the winner. Santiago’s photo “follows the rules of composition properly and also the river flowing in between creates a dramatic effect in the image,” says Desai. As the winner, Santiago will receive a case of delicious wine as sponsored by Naked Wines. TimeWave thanks Naked Wines as well as award.iofor running the contest with an elegant 21st century vehicle. Although other photo submissions by TimeWave artists and crew didn’t make the cut, the TimeWave team was thrilled by their participation in the contest. 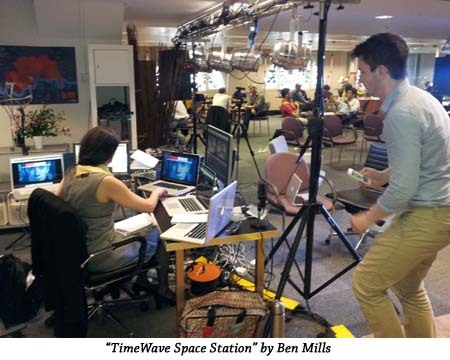 In particular, British director Ben Mills submitted a shot of the TimeWave space station in which Production Designer Simon Gethin Thomas and Producing Artistic Director J Dakota Powell were sweating it out over the technology required to make the festival happen. 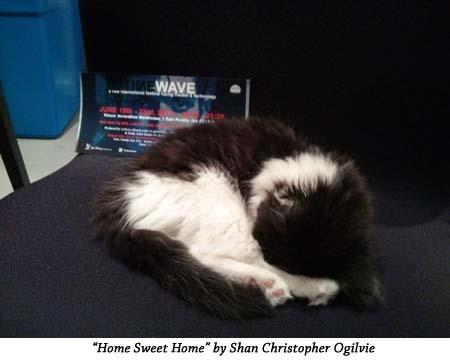 Camera operator Shan Christopher Ogilvie also submitted a wonderful picture of Princess, the Innovation Warehouse startup kitten.